This CIOB Continuous Professional Development (CPD) event was organised by Briony Milton (Member Services and Events Coordinator – Dorking) on 24 October 2017 in the Cockcroft Building. 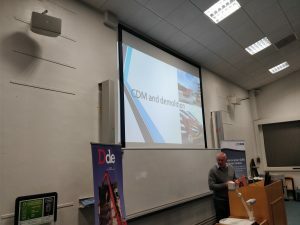 Dr Terry Quarmby gave a fascinating presentation on the often misunderstood construction sector of demolition. The event was facilitated on behalf of the university by Dr Hannah Wood. The presentation was well-attended and enjoyed by industry practitioners, academics and students. This entry was posted in Construction, Life at Brighton, Seminar series, Undergraduate.